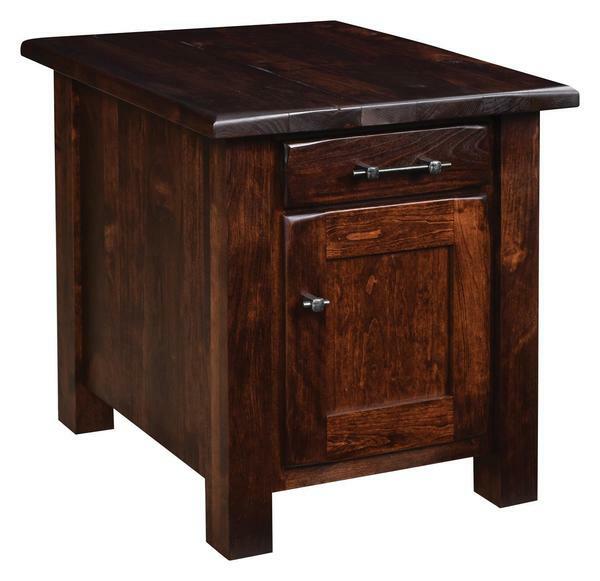 Add the clean, rustic contemporary design of our Amish Barn Floor End Table with One Door to both ends of your sofa or one next to a seating area in your office. The solid wood, planked top, provides a spot for you to place home goods like a lamp, framed photos, coasters (with a glass of wine or whiskey on top), and a book. Under the 1 1/4 inch thick top a fully-extending dovetailed drawer provides a place to hide the remote, a pen, pad of paper (for your next brilliant idea) and more. The enclosed design includes a Shaker panel door with one shelf. Shown in rustic cherry with OCS-117 Asbury stain, but available in a variety of custom wood, finish, and hardware options.